Door canopies have been decorating and enhancing homes for centuries and, in recent times, there has been something of a revival in the external decoration of homes. Period properties are being restored with original features as we recognise how a door canopy can be both a practical and decorative addition, creating an immediate visual impact and a homely, inviting entrance. A porch canopy will improve the appearance of your home, but also offer wet weather protection for you and your visitors. You’ll no longer have to worry about a slippery step as you go through your door. It will protect your front door from the rain too, and prevent deterioration of paintwork. 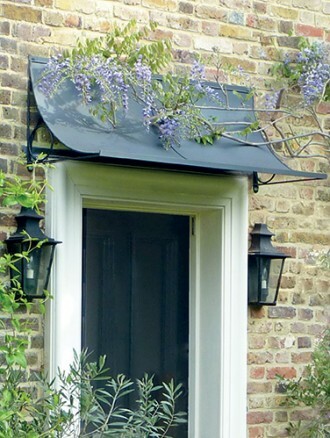 Our porch canopies are produced in a range of timeless and elegant design variations – choose from Scoop canopies, Arched canopies, or to grow roses around your door, choose a wirework lattice canopy design. We can adapt our designs to accommodate any architectural features or light fittings that might obstruct the positioning of your canopy.